“Leaving a Legacy of Land” will be the topic of a presentation by Bryan Pierce, Executive Director of the Northwoods Land Trust (NWLT), at 6:30 p.m. at the Mercer Library on Tuesday, April 16th. According to Pierce, voluntary conservation of private shorelands, woodlands and wetlands can help to keep the northwoods the northwoods, while helping keep family lands intact for future generations. The presentation will highlight the variety of voluntary conservation options available to private landowners working with local land trusts. Since its inception in 2001, the Northwoods Land Trust has primarily worked with land protection agreements, also known as conservation easements, to protect over 13,000 acres of woodlands and wetlands, and over 70 miles of natural lake and river shorelands. Based in Eagle River, the land trust works in a multi-county area of northern Wisconsin including Iron, Price, Vilas, Oneida, Florence, Forest and northern Langlade counties. Bryan Pierce became NWLT’s first Executive Director in 2004. Pierce formerly worked with the University of Wisconsin-Extension for eleven years as a tenured faculty serving as Community Resource Development Agent in Vilas and Oneida Counties. Prior to UWEX, he worked at a variety of nature and environmental education centers in Wisconsin and Iowa. Pierce has a Master of Science degree in natural resource management with emphasis in environmental education from the University of Wisconsin-Stevens Point. His Bachelor’s degree in zoology was from UW-Madison. Pierce served as the founding President of NWLT in 2001, and recruited the original Board of Directors. The organization grew out of regional lake leader training workshops where lake organization leaders and lake property owners expressed a need for permanent protection options for natural lake shorelands. Protection of high quality lake and river shorelines remains among the highest conservation priorities for NWLT. “We have already been successful in completing six conservation easement donations with interested property owners in Iron County. Those projects have included permanent protection of over 27,000 feet (5 miles) of natural lake, river and stream shorelines and 680 acres of shoreland, woodland and wetland habitats. These successful projects have already leveraged well over $1 million of charitable contribution values through those conservation easement donations. The Northwoods Land Trust also raised funding and was able to purchase the 38-acre Interstate Falls property just west of the intersection of U.S. Highways 2 and 51. That scenic property was then gifted to the Town of Kimball to remain a valuable scenic tourism attraction and conservation area in perpetuity. The Northwoods Land Trust is a member and volunteer-supported, nonprofit conservation organization. This program is provided by the Northwoods Land Trust and also sponsored by the Mercer Public Library and ICORE, Iron County Recreation Enthusiasts. For more information on the presentation, contact the Mercer Library at (715) 476-2366 or NWLT at (715) 479-2490. 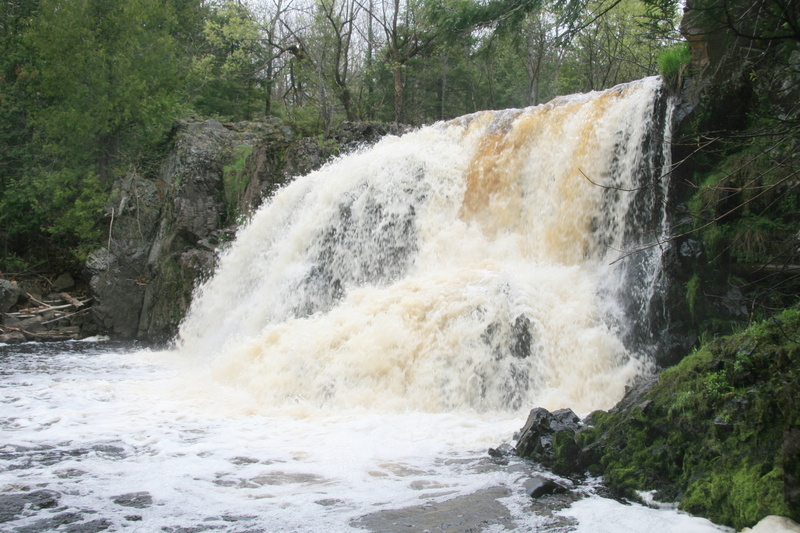 With the help of a Knowles-Nelson Stewardship Fund grant, the NWLT purchased Interstate Falls, a 38-acre property with an 18’ waterfall, near Hurley, WI. NWLT then gifted it to the Town of Kimball (in 2016) to keep it open to the public.